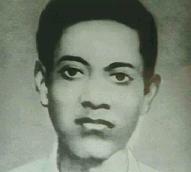 Today is the centennial of Basanta Kumar Biswas‘s execution for the Delhi-Lahore conspiracy. 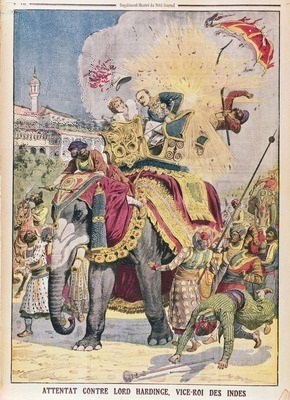 One of the conspirators’ signal blows was tossing a bomb into Hardinge’s elephant-mounted howdah. This explosive lacerated Lord Hardinge with shrapnel, but it did not slay him — neither him, nor the Raj. (The poor elephant-driver was not so lucky.) But the authors of the deed remained obscure for many months despite the state’s intense investigation, and lucrative reward. While the British hunted, the terrorists/freedom fighters authored a second bomb attack — one that would eventually form the basis of their prosecution. Biswas was tasked with assassinating another colonial official with another bomb, but finding that sentries prevented his approaching his target, he lodged the device on a carriageway, hoping it would detonate under the wheels of some passing viceregal envoy. Instead, the roadside bomb was struck by a messenger on a bicycle — with lethal effect. Three other men were condemned to death at the same trial: Amir Charid, Abadh Behari, and Balmokand. Biswas himself received only a prison sentence, but it was upgraded to hanging on appeal. Several plaques in India — and one in Tokyo, placed by an expatriate — commemorate the young man as a national martyr. * The measure of Hardinge’s success was London’s ability during World War I to deplo most of its occupation troops plus over a million Indian soldiers to other theaters without losing control of India — despite the best efforts of the Central Powers to foment a wartime mutiny on the subcontinent.